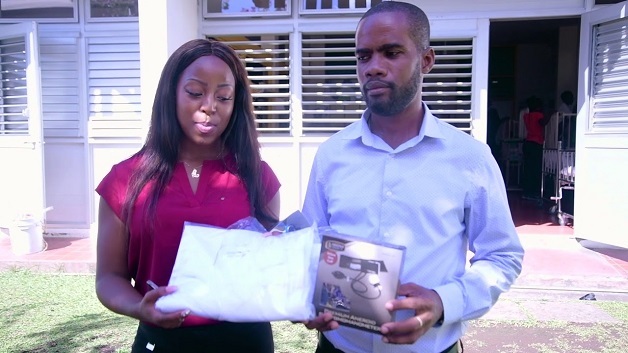 Zovel Olivia Hyre a Medical Student at the St. James School of Medicine donated some stethoscopes as part of finding resources to assist the Milton Cato Memorial Hospital here in St. Vincent and the Grenadines. The donations were sourced from medical company, StethoHope. This is the second time this student has taking the initiative to assist the hospital within a short space of time, her last donation being in December. The company came onboard when Zovel took the initiative to contact the founder, to discuss the prospective of extending their donation outreach to St. Vincent, to help meet the need that was identified. The founder devised a discount code, namely “HOPESVG” and promoted the outreach initiative on the company website and social media platforms. According to a post on the Ministry of Health’s Facebook page, with every stethoscope purchased using the discount code “HOPESVG” the buyer would receive a 10% discount, and one stethoscope would be donated to Zovel’s outreach mission for the Milton Cato Memorial Hospital in St. Vincent. A total donation of 21 stethoscopes, through StethoHope, was provided which includes their original Mandela One Cardiology stethoscope and the newly released McCune Cardiology stethoscope.